Pumpkin beer, like anchovies on pizza or shorts on men, can be a divisive topic: you either like it or you don’t. If you don’t, well, walk on by — nothing to see here. But if you are, like me, a devotee of the gourd-based brewing arts, you are well aware that not all pumpkin beers are created equal. Which one is the best? More to the point, which one is the best for you? 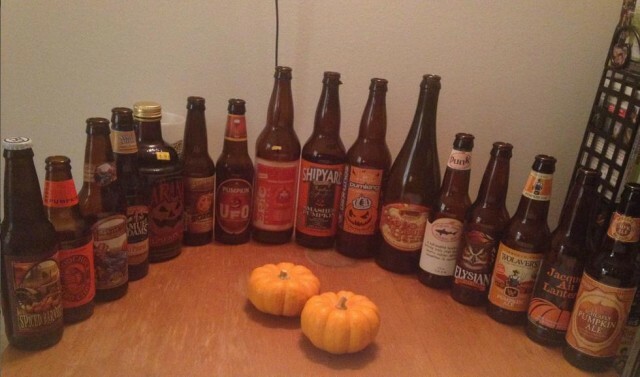 There are so many pumpkin beers, and so little time in which to drink them. Let me make your autumn easier — for the past two years, I’ve held a pumpkin beer tasting, pitting competitors head to head in a bracket-style throwdown with the goal of finding the tastiest pumpkin beers out there. The Spiced Sixteen. 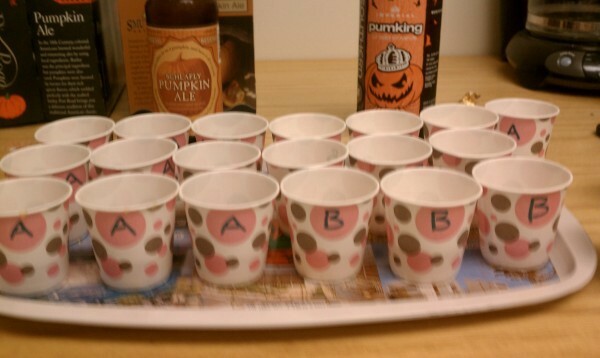 Each of the offerings was seeded* by a random draw and sipped out of tiny cups by a panel of twelve pumpkin-beer aficionados, who cast votes to decide which made it to the next round. ** I’m going to spoil this year’s bracket for you now: DC Brau/Epic*** Fermentation without Representation came out on top. Which is, for the purposes of this article, a disappointment because it was a limited release offering from last year brought by a friend who collects and ages beer. If you can find it: cool! Enjoy! But otherwise: Consider what you want in a pumpkin beer. Light? Sweet? Pumpkin-y? Pie-y? Dark? There’s something for everyone out there, and I’m here to help you find it. Above you’ll see this year’s Spiced Sixteen Bracket. Here are some standouts from the past couple years of tasting. Notes: At our tasting, Punkin lost a close first round match (5 votes to 6) to the eventual winner. The pumpkin flavor isn’t overpowering or overspiced, but there’s enough of a brown sugar taste presence to place it in the middle of the scale between pumpkin and pie. This is a good pumpkin beer if you don’t want to overthink things too much: if you like pumpkins and you like beer, Punkin won’t let you down. (Schlafly is very similar, and either would be a fine introduction to the field). Notes: Southern Tier won last year’s Spiced Sixteen in a near-unanimous vote. With good reason: it’s sweet without being too syrupy, and the flavor is balanced nicely between pumpkin pie spices and a softer vanilla, almost a pie crust flavor. If you want a pie beer, Pumking will knock your socks off. Notes: Smashed Pumpkin came in second this year, likely due to its ability to be pie-like while remaining crisp and light — it definitely doesn’t taste like it’s 9% ABV! It was kind of a sleeper hit; I don’t think anyone had it pegged as going to the Chomp-ionship round, but when the dust settled, there it was. Steady and reliable. Notes: This received relatively poor initial reviews, though I chalk that up to surprise rather than it actually being a bad drink. You see, it’s intensely bubbly and extremely light — it tastes more like a sparkling pumpkin soda than anything else. As long as you know what to expect, it’s a fresh spin on the style. And a bonus I discovered the following night, spiked with cake vodka it makes for a pretty satisfying cocktail. Notes: Starr Hill is decidedly on the other end of the scale — it’s deep, pumpkiny, and malty. with a little hint of ginger and nutmeg at the end. Additionally, it just tastes roasted in the most satisfying way. Overall, it’s deliciously complex. Though there are many pumpkin porters out there, Starr Hill is one of the few that manages to avoid the unfortunate oily taste. Definitely one to enjoy on a cold night, ideally near an open fire. Notes:This beer smells like a pumpkin pie, but the taste has minimal spice and sugar. The flavor is just pure, unadorned pumpkin. I get the impression that making a palatable pumpkin-ier beer is much more challenging than making a pie-ier beer, which makes this all the more impressive — it is strongly pumpkin and very, very good. Of all the beer described here, this one would be the best to pair with fall foods like braised anything or tarte tatin. 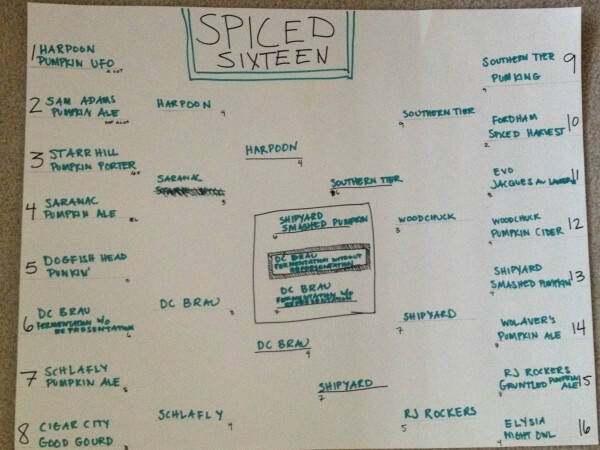 Notes: The 2011 Spiced Sixteen featured a side competition between two beers from larger-scale breweries: Sam Adams vs. Blue Moon. Blue Moon’s was pronounced undrinkable**** but Sam Adams’ got positive enough reviews to warrant the upgrade to inclusion in 2012’s bracket. Sure, it’s no revelation, but it doesn’t claim to be — a simple, but good pumpkin ale. Those are some of the highlights. But where there are highlights, there are also lowlights. Notes: It just smells kind of foul, and the taste isn’t much better. That oily taste I mentioned above? Jacques au Lantern has it in spades. This was a surprise and a shame, because Evo has produced some very good beers. But… this one lost to the Woodchuck. Draw your own conclusions. Notes: Smells fantastic! Like a clove-heavy pie coming right out of the oven. Pity it tastes like… well, have you ever left a cup of water on your desk over the weekend, and thought it would be fine to drink on Monday? Yeah, it’s like that. My sister, previously noted in this space for serving me terrible things, brought a bottle of Kennebunkport Brewing Company’s Pumpkin Ale, which the aforementioned beer ager gleefully pointed out is Beer Advocate’s lowest-rated pumpkin beer. We sampled some between rounds, prompting these comments: “Was this brewed with cinnamon fireballs?” “Is there any pumpkin in this at all?” “I think they dumped in a bunch of vanilla extract at the end and forgot to stir” and “[sound of beer being spit back into cup].” That said, one participant gladly finished the bottle — proof that there really is something for everyone. * Pun not intended! Okay, pun sorta intended. ** The Spiced Sixteen were narrowed down to the Eerie Eight, the Final Gourd, and the Chomp-ionship Round. That previous pun sounds more intended now, huh. ***The Utah Epic, not the New Zealand Epic. Though both are excellent breweries! **** How undrinkable? Well, one of the best parts about hosting these is that everyone brings a sixpack (or two large formats) and at the end of the night, everyone is able to take a few bottles of their favorites home. 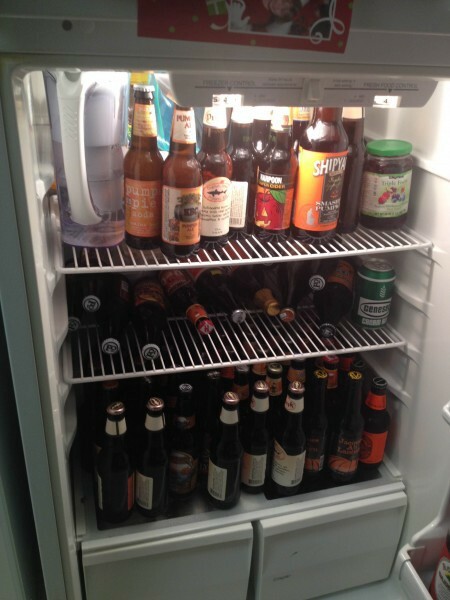 When emptying out the fridge to make room for this year’s stock…I found three of these hidden in the back. Yikes. Victoria Johnson still hasn’t found a good pumpkin latte. Legible bracket handwriting courtesy of Kia Matthews.